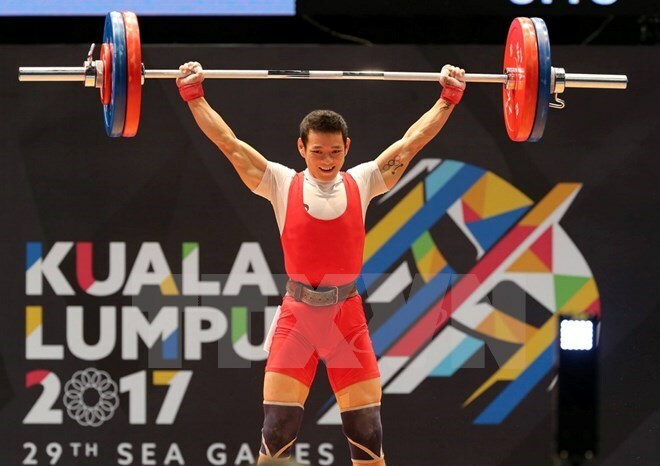 Hanoi (VNA) – Weightlifter Thach Kim Tuan on August 28 won a gold medal in the men’s 56-kg event for Vietnam at the ongoing 29th Southeast Asian Games (SEA Games) in Malaysia. The silver medal went to Indonesian athlete Surahmat with a lift of 267 kilograms while Thail lifter Witoon Mingmoon bagged a bronze medal. Later, Vietnam had one more silver medal in women’s rhythmic gymnastics mixed apparatus (two ropes and three balls) thanks to the team of Le Viet Trinh, Nguyen Hong Nhung, Pham Nguyen Van Nhi, Trinh Huong Giang and Truong Mai Nhat Linh. The gold went to host Malaysia.